Veteran highlife artiste, Gyedu Blay Ambolley’s assertion that no Ghanaian Reggae/Dancehall Artiste will be able to win the Grammys has been met with reactions from Stonebwoy, pundits and some music lovers. Abrantepa.com earlier reported that Ambolley believes it would be a mistake for Ghanaian Reggae/Dancehall Artistes to win since they do not portray the culture and identity of the country in their music. He told KMJ on Hitz FM’s Daybreak Hitz that the lack of originality would certainly be an impediment. Responding to the claims, Stonebwoy tweets that though he respects the opinion of Ambolley, he disagrees. Entertainment critic, Prince Tsegah who is a regular pundit on Daybreak Hitz expressed utmost surprise at Ambolley’s thought and described it as unfortunate. “I didn’t know Gyedu Blay Ambolley had his own criteria for the Grammys and BET. It’s so unfortunate. From the submission he gave, he feels they should award originality but I have a problem with that. You can’t reinvent the wheel. If there is a particular rhythm people ride on like reggae, there is nothing you can do to it. The only thing you can do to make it African is to put a local language on the rhythm. How isn’t that enough? 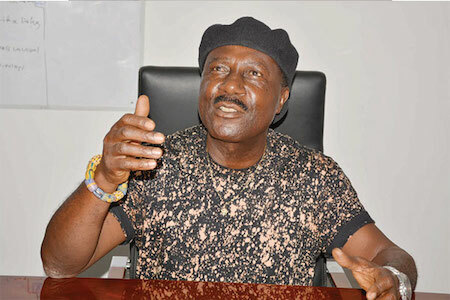 I don’t see why Gyedu Blay Ambolley should have a problem. This is the second time he is attacking Stonebwoy. As a big brother, he should be more of an encouraging tool than a discouraging factor,” he said. For artiste manager and entertainment critic, Kwabena Poku (Ashes), though he sides with Ambolley’s point on identity, it is out of place to say no one can achieve that height. “He should rather encourage the young ones. What you couldn’t do, you push the younger ones to achieve. He makes logic in saying we should inculcate some of our local rhythms, it doesn’t mean if we don’t, we won’t get there. He should be a role model,” he said. “For me, Ambolley made that statement within a certain context. 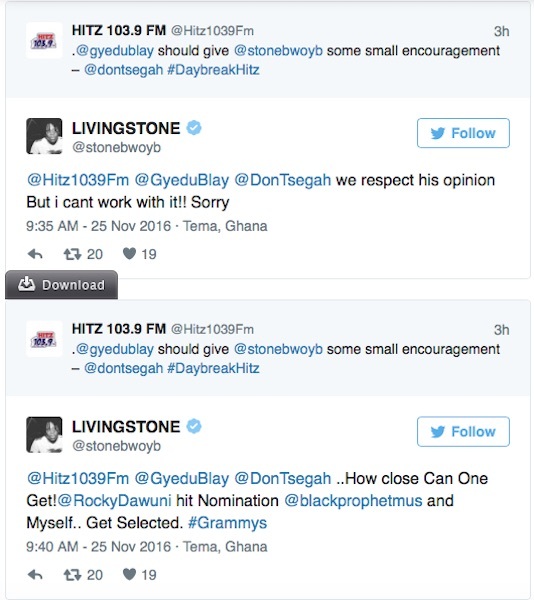 I think based on the historicity of the Grammys and African’s who have won, I would want to believe was what informed these comments… but I disagree that Stonebwoy does not stand a chance. The young man is doing very well that is why he is up for consideration. As to whether he can win or not is neither here nor there… The essence of getting a nomination or being considered for a nomination gives you a world platform. It is an impetus and a feather in your cup. The fact that you are being considered is a capital value,” said another panel member, Chief Charles. Listeners who called to the show unleashed venom on Ambolley as they regarded his comments as sheer hatred. Stonebwoy and Black Prophet’s albums LIVINGSTONE and STORIES OF LIFE respectively are up for consideration for Best Reggae Album at the 59th edition of the prestigious awards ceremony. Internationally celebrated Ghanaian Reggae artiste, Rocky Dawuni, was nominated in the ‘Best Reggae Album’ category at the 2016 Grammy Awards for his album ‘Branches of the Same Tree’. Dawuni made history as the first Ghanaian to be nominated for the scheme. Also nominated in that category were Jah Cure for ‘The Cure’, Barrington Levy for ‘Acousticalevy’, Luciano for ‘Zion Awake’ and Morgan Heritage for their album, ‘Strictly Roots’. Dawuni lost to Morgan Heritage.